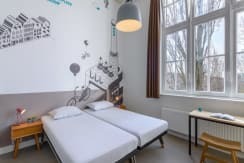 Stayokay Amsterdam is located in the Zeeburg neighbourhood east of the city centre, just 15 minutes away from all the famous sites by tram or bike. The tram station is 200 meters away from the hostel and you can be in Rembrandt Square in just 10 minutes. During the day you can tour the canals, visit the museums or shop on Kalverstraat. At night, you can hang out at the hostel where you will find lots of activities. 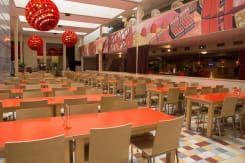 The hostel has a cafe – restaurant so you don’t need to travel far for food and also in the building there is a cinema and theatre to keep you entertained. 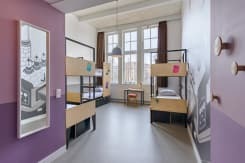 The hostel was once a school in the 1900’s so you can experience some history while enjoying modern facilities at the same time. 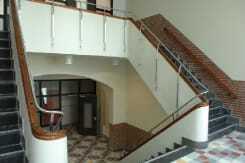 The large rooms are suitable for groups and have private bathroom facilities. 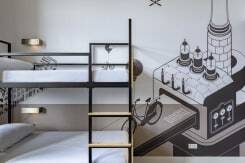 The rooms are beautifully designed by Edward van Vliet. Rooms are ready for guests from 2pm and check-in is available at all times. If you arrive early, the hostel can hold on to your luggage until your room is ready. Bike rental is available from the hostel! City tax is excluded and payable upon arrival (7% per night). 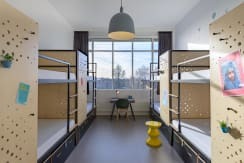 The hostel is part of the HI (Hostelling International) Organisation and guests with an IYHF membership can benefit of a €2.50 discount per night. •	Children under 12 years, is only allowed on private (family) rooms toghether with parents. •	Children under 18 years are allowed in company of an adult. Check-in: 24/7. Rooms are available from 2pm. You can store your luggage for free until that time. Wi-Fi is free and accessible throughout the entire hostel. •	Children under 12 years, is only allowed on private (family) rooms together with parents. -If the cancellation is made before 3pm on the day before arrival, the guest is not obliged to pay anything to Stayokay. -For cancellation after 3pm on the day before arrival, the guest will be required to pay Stayokay 100% of the reservation price. 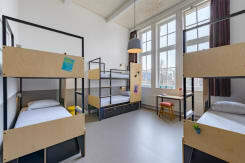 From Schiphol Amsterdam Airport you can travel to the hostel by train. Every 10 minutes a train leaves in the direction of Amsterdam. Get off at station Amsterdam Central Station and change to the train to station Amsterdam Muiderpoort. Normally this train leaves from the same platform. Get off at station Amsterdam Muiderpoort. Walk along the Insulindeweg (turn left when you took the stairs). Then turn left to the Sumatrastraat. You will find Stayokay Amsterdam Oost at the end of this street. A train ticket will cost about € 4.20. From Schiphol Amsterdam Airport you can also take a shuttle bus that leaves every 30 minutes from 07.00 to 21.00. You can buy tickets at the Connexxion counter which you will find at Arrivals 4 - Schiphol. The bus will cost about €16.50. The shuttle bus will drop you off right in front of the hostel. A taxi from Schiphol to Stayokay Amsterdam Oost will cost about € 45.00. From Amsterdam Central Station, you can reach the hostel with bus 22. You will find the busstop for bus 22 in front of the Victoria Hotel. Take this bus in the direction of 'de Indische Buurt' and get off at Javaplein. Walk into the Borneostraat. You will find Stayokay Oost after a few minutes on your right-hand side. When you travel by car, please keep in mind that you cannot park in the area for free. Parking is € 2,40 per hour, between 9 am and 9 pm. A cheaper place to park is the P+R Oost . Here the parking is € 8 per 24 hours. From there you can take bus 37 in the direction of Amstelstation. Get off at Molukkenstraat. Walk along the Insulindeweg and turn right at the Sumatrastraat. You will find Stayokay Amsterdam Oost at the end of this street. Stayokay is looking forward to your visit!